I have a picnic blanket that I bought for I think $7, about 10 years ago. You fold it up and there is a zipper that goes around it and then it has a strap. Great idea....ugly colors AND toooo small for my family of 7. 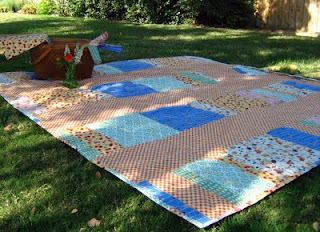 So a few years ago I was commissioned by an etsy customer to create "the ultimate picnic blanket" as she so lovingly referred to it. This blanket started as a small project but got big real fast. Her blanket ended up measuring almost the size of a king blanket. The top was created from reproduction vintage prints and the back of a fabric called cordura, most commonly used for backpacks. She chose this fabric because of its durability and waterproofness. She lives in NY and wanted to keep all the muddy yucky street germs on the outside of her lovely fabric...who can blame her. Well here is what I ended up creating for her....I did not want to give it up! So I decided that I would eventually make one for our family since I had the practice on this one! Well that was spring 2008.......anyways I have been collecting jeans for many years now with the intentions of a big blanket some day...today is the day! I cut and cut and cut....there was a massive pile of denim squares and still had enough jeans left to make a few more blankets. I also had an old duvet cover that I planned for the backing and binding. cutting denim is very messy to say the least! So maybe someday I will share a tutorial on how to add gussets and a zipper to a blanket. It actually is quite simple just takes some thinking and SILENCE....I had to send the kids outside for this one. Here is a picture of how it is applied. I used a 48" plastic zipper, a 4" strip of jeans and a nylon strap from an old duffel bag. we have already used it ALOT!